Core Strengthening | Coach Billy. Meet “Pat,” though her head is flourishing with grey hair, she’s still active and robust in relative physique. She comes to the gym to train with me twice a week on top of her daily physical activities such as walking, Gardening, and singing (she keeps convincing me it’s a physical activity since you work the diaphragm, and not a lot of people know how to properly do that). This month, she just turned 75 years old and is still continuing to train regularly. She had a surgery on her right hip, right shoulder, and heart but I’ve trained with her long enough to convince me of her favourite motto “all the parts that I have still works!” Pat trained with another trainer before but stopped for a bit while waiting for the new gym in her area to open. I started training training with her in the first half of this year and I’m just amazed with her energy and strength! 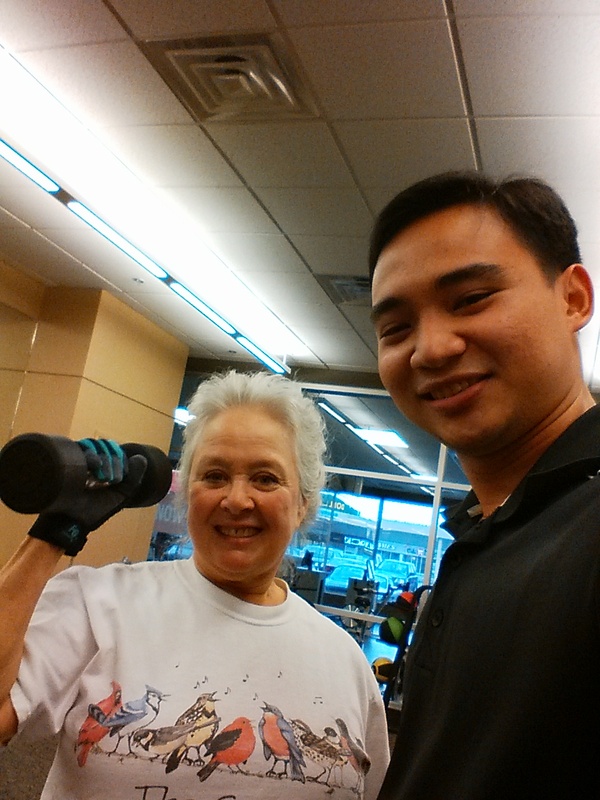 I have trained other elderly clients in the before but Pat is the strongest of them all! She’s actually looking for a ‘competitor‘ – a fellow senior citizen who goes frequently in the gym and lifts as much as she does. So far, I’ve found none! Her hobby is Gardening and it keeps her busy until the snow falls so we make sure that her lower body and low back strength and flexibility is maintained. And here’s a 74 year old man (during the time photo was taken) doing an OAEL. Are you looking for a dynamic body weight workout? Do you want to do a challenging circuit but you don’t have time for the gym? Are you bored of doing the same exercises again and again? Then you should try the TRX suspension training system! What is the TRX suspension training system? The TRX suspension training system, or simply the TRX was designed by a Navy Seal who wanted and needed to stay in shape even while at work. Since they are usually on the field, he had to develop something that requires a limited amount of space and use whatever equipment available. He adapted the rope exercise system and developed it into a cable and further into suspension training. The whole idea is to let your body weight “hang” using the suspension system for a whole body workout. Realizing how effective yet compact the training system was, TRX made its way into the fitness industry and is now being used by professional sports teams, MMA fighters, coaches, and top trainers around the world. How does TRX suspension training work? TRX is a type of training that uses gravity and your own body weight to build strength, endurance, balance, coordination, flexibility, core and joint stability. It is completely safe to use by anyone and even minimizes risk of strain and other injuries. Even without using weighted plates for resistance, the challenging suspension exercises helps improve muscular performance and bone density. No matter what your training goals may be, the TRX can help! If you are a beginner, you can lessen your training time by working your whole body, switching from one exercise to another in literally just seconds! This efficient tool also strengthens the core muscles – your abdominals, hips, gluteals, back, and lats. Because your body is constantly challenged by gravity, every exercise using the TRX suspension training system engages and totally works the core! You will improve not just your strength and stamina, but also your flexibility, balance, coordination, and stability. Since every physical activity that we do in life needs a strong core, you will definitely benefit from this versatile exercise equipment. Whether it is bending over to pick up the pen you dropped in your office, washing your car, playing sports with your kids, or participating in the Ironman, you will benefit from a strong core that is well developed by the TRX suspension training system. Having a strong core is important to minimize the risks and prevent injuries not just on your low back, but throughout your entire body. Think about how getting a strong core and stable trunk improves not just exercise performance but more importantly your way of life! With the TRX suspension training system, you use your own body weight to workout according to your own fitness level, needs, and goals. You can easily decrease the intensity of the exercises just by stepping closer to where you anchored your cable system. If you think you are ready for more challenging workouts, then step away from your anchor and you already increased the intensity of your TRX workout. You don’t need to keep adjusting the plates on your barbell or dumbbell! You can constantly challenge your body and quickly adjust the intensity that you need specifically per exercise. If you want to build muscle size and strength, the TRX suspension training system is also the exercise equipment of choice.This dependable exercise tool actually works better than using gym equipment like machines, barbells or dumbbells since apart from working out targeted muscles, you also challenge your core constantly in every workout! TRX also strengthens all the stabilizing muscles around the joints that you are currently working on and challenges your whole body in a way that it has not been challenged before when you were using gym weights or machines. The TRX suspension training system offers workouts that results to more strength and power from your exercise routines and gives you a strong foundation with less chances of muscle strains and injury. If you are up to a more challenging workout, TRX can also be a great tool for plyometric type training for an added increase in your power output. The TRX suspension training system can indeed be very challenging and intense but it is also low impact, ensuring the safety of each exercise that you do. You can wear a weight vest to make the exercises even more challenging. The TRX helps you reach some ranges of motion that you may not have been able to reach before. It offers great support while recruiting more muscles. Are you looking for a cardio workout to lose weight and build muscle endurance? The TRX will fire multiple muscles, which increases the heart rate, burning more calories than sitting or standing through a “traditional” exercise. TRX can keep you constantly moving from one exercise to the next in a circuit-like manner. This strengthens your heart as well as increases muscular endurance. Can I use the TRX suspension training system for cardio workouts? Yes, you can! The TRX fires multiple muscles, including the large muscles of the hips, back, and core, which will increase the heart rate and burn more calories. In fact, it burns more fat than sitting or standing through a “traditional” exercise routine. With the TRX suspension training system, you can constantly move from one exercise to another, just like in a circuit or high intensity interval training. This will surely strengthen your heart (cardiovascular system) as well as increase muscular endurance. What is the advantage of training using the TRX over traditional training? Traditional styles of training are usually performed in one plane of movement – forward or backward as in pulling or pushing types of exercises. If you are a beginner in most gym, you may even be required to do the exercise in a seated position to minimize injury. For most exercises that use big muscle groups in the upper body, you do it sitting down. An example would be doing a seated chest press, a seated cable row, or a leg press, none of which challenge the core the way we need it to work for our daily activities. The TRX is a functional training system which means that it mimics the movements that we do in our daily routine. We don’t always move in a forward, backward motion and supported by a seat in our day to day physical activities. We need to engage the core as we move left, right, forward, backward, diagonal, twist, and bend. This is exactly how the TRX suspension training helps prevent injuries while developing a strong and stable core. By challenging the body in other planes of motion, you are training and exercising for daily activities and reducing chances of injury. What are the exercises that I can do to enhance my performance? Like any new exercise program or introduction to new equipment you have to start with the basics until you have mastered the proper form and technique. This helps you recruit the appropriate muscles and prevent injuries after a couple of weeks of training. The TRX suspension training package includes exercises that you can do safely and effectively at home, in the office, or anywhere you bring your TRX to! Here are some of the basic exercises that you would start off with when you first get going on the TRX: Chest Press, Row, Lunge, Squat, Plank, Tucks, Pike, Side Lunge, Oblique Twist, Back Extension. Read more about the TRX suspension trainer here and see some exercises. Who is TRX training for? You can see that the TRX system is very versatile for everyone: young, old, pro-athlete, recreational athlete, stay at home mom, body builder – no matter what your goals are and what your fitness level is, the TRX suspension trainer is for you! Get started and take your physique to the next level! Click the banner below to order your gym in a bag now! Here is a good resource for Bodyweight exercises that you can do at home or in the gym. The video claims 44 different exercises, but I cut it down to 40. Some of the exercises are just variations of another. Some of them also requires a few equipment like a stability ball or a pull up bar, but most of the exercises can be done at home without any equipment. You can see different kinds of push-ups, variations of pull-ups, roll outs, and of course, burpees. This is a good list, but one thing I noticed is that they’re mostly upper body exercises. This guy needs to squat! Out of the claimed 44 exercises, there are only around 5 to 8 exercises that targets the legs. If he included the squat and lunge variations, the list could be longer!